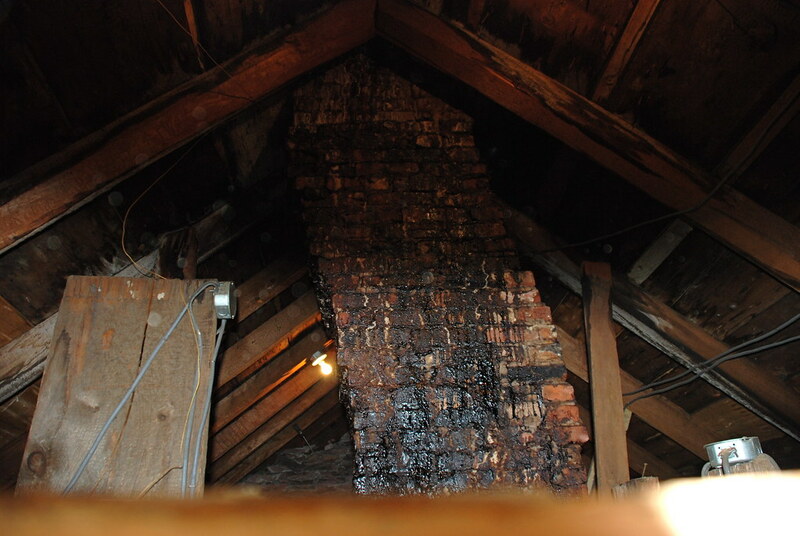 So I was able to find someone to hold the ladder so I could take a picture of the chimney in my upstairs attic. I have to say it looks even worse than I thought! It’s “S” shaped! Why a chimney would be built “S” shaped I have no idea. But it is in rough shape. So the chimney repair man came through with a decent estimate so I will be having him install a new power vent for the furnace and the chimney will be coming down as soon as we get some non-rainy weather. Oh boy, it is going to be fun taking that chimney apart brick by brick in my spacious attic! Save the bricks!! You never know when you’ll need old bricks for something. Anna, that is a great idea! After reading this, and remembering you had a recent issue with your walls and the plaster, I thought of The Petch House blog. Have you ever read this? He purchased a late 19th century house in 2002 and over the past few years has been doing ALL the work himself…(and it needed an insane amount of work). Anyway, thought you might enjoy reading through his older posts..he ran into a lot of interesting house issues that you may find helpful to read (or just familiar and/or entertaining). Thank you for the link to Petch House, it is very interesting and informative reading! It will be a big relief when the chimney is out of the house! Chimneys are built S-shaped in order to (a) assure that they won’t work properly and (b) make them more entertaining to disassemble. Old house renovation should start from the assumption that all decisions made by previous owners were BAD. That way, the exceptions come as a pleasant surprise.